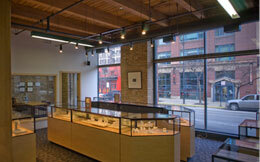 How to Purchase - Leber Jeweler Inc.
You may shop with confidence at our retail store in Chicago or our online store. Feel free to contact us via email or telephone and we will guide you step by step through the process of shopping for any item from our Earthwise Jewelry® collection. We often have additional designs in our retail store to those that appear online, and we are always pleased to create a one-of-a-kind custom piece especially for you. You may order complete engagement rings online or, should you wish, we offer our personal assistance to guide you with your selection of an engagement ring—just email us at info@LeberJeweler.com; phone 312-944-2900; or fill out a Request Info form. All engagement ring settings are priced separately from the center stone so that you can select exactly what you want. We offer Canadian diamonds of all shapes, sizes, and quality, as well as a rainbow of fairly traded colored gemstones. Please let us know if there is a date you are targeting, as rush orders can often be accommodated. While we make every attempt to meet request dates, complications due to unforeseen factors can occur, so we encourage you to allow plenty of lead time. We provide complimentary shipping via UPS Next Day Air, so packages typically take one business day for arrival. When you place your order, we ask for a billing address, a shipping address (where someone can sign for the package), phone number, and email (so we can provide tracking information when we ship).